Francie Coyle is from Derry. He is married to Maureen and has four children. Francie’s story is not about him, it’s about his son Paul. “Paul was the second youngest. When he was born he was diagnosed with a heart condition which needed surgery. As with everything Paul faced, his bravery and strength shone through, as he successfully came through the surgery and grew up to be a strapping young man. “Upon leaving school Paul aspired to be a head chef at a top restaurant. He began his training in the catering industry and after nine years of studying and working in kitchens his dream came true, when he became head chef at Da Vinci’s Hotel in Derry. 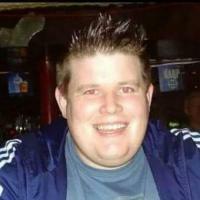 “When not working, Paul loved to play rugby and played on a regular basis with the City of Derry. He was also a die-hard Liverpool fan and regularly made trips over to see his beloved team with his friends. “In 2011 Paul developed a lump. It was initially thought to be a sports injury acquired on the rugby field, but it was later discovered to be a type of cancer called a sarcoma. By the time it was diagnosed, it was too late. Paul was just 28 when he passed away. Cancers of the bone and connective tissue (sarcomas) are rare. They can arise in any part of the body and there are many different types. They can be divided into bone sarcomas and soft tissue sarcomas which includes fat, muscles, blood vessels, deep skin tissues, nerves, tendons, ligaments and the tissues around the joints. broken bone (bone cancer is sometimes discovered when a bone that has been weakened by cancer breaks spontaneously or after a minor fall or accident). "When people think about cancer they often associate it with older age or unhealthy lifestyle, but cancer can affect all ages and bone sarcomas can particularly affect younger people,” continued Francie. “Paul was a healthy young man in the prime of his life; his story shows that cancer can affect anyone.